It was almost three years ago when the oil industry took a nosedive. The headlines told stories of lost jobs and struggling towns,but now, despite the continued downturn, things seem better. At least in the Permian Basin of west Texas. There’s a sound common to much of the region: the slow, steady creak of a pumpjack. It’s a seemingly mundane, yet tangible, sign that the state’s oil economy is humming along. With oil prices stabilizing, the Energy Information Administration expects oil pumped from west Texas to lead the way to record-high production next year, passing a peak set back in 1970. You can see the story of the Permian off a lonely highway: within just a few hundred yards of each other, three drilling rigs out looking for oil and gas, despite prices hovering around $50 per barrel – not exactly a number to get excited about. In recent months, big players like ExxonMobil have made new, major investments in the region. The industry is expanding into previously unattractive areas near the Davis Mountains, in the Delaware Basin. Oklahoma-based ONEOK just announced plans for a new pipeline, and ExxonMobil has bought an oil transport terminal in what the company calls this “rapidly growing” area. 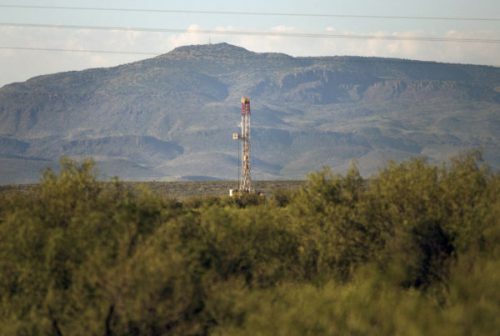 Perhaps the most notable example of the industry’s physical expansion is a controversial natural gas pipeline that, despite protests from many locals, now snakes through previously-untouched parts of the West Texas borderlands. Researchers with the global firm IHS Markit even have a new term for the Permian. “The Permian has been dubbed, by their definition, as a ‘superbasin,’” says John Roberts, the firm’s director of global subsurface content operations. In September, Roberts and his team finished the first of a three-part project to find out just how much oil west Texas still holds. “Even though it’s a ‘superbasin’ and has made over 38 billion barrels of oil since it was discovered 95 years ago, there is almost twice that to still make with horizontal drilling and with advanced [hydraulic fracturing] technology,” Roberts said. It’s a game companies are now better at playing. University of Texas researcher Eric van Oort is helping to develop that lens. “We’re actually positioning ourselves for this new reality of forever lower,” van Oort said during a recent tour of his humble-looking, two room “drilling lab” tucked away in a quiet corner of the university. It looks typical enough – a few computers, a whiteboard, grey walls – but the main attraction is a life-size simulator of a drilling rig chair, complete with all the dials and knobs you would see on the real thing. Here, van Oort said, he’s workingon ways to automate the drilling process. He says the lab’s goal is to cut the time it takes to finish a well – and the number of workers at a rig site – by half. In some ways, it already is. A study this year from Louisiana State University found that advances in drilling techniques have led to a “breakeven price” – the price at which a well isn’t losing any money – of just $39 per barrel in the Permian. Local businesses like Sharon Ifera’s are feeling the impact. Ifera has been through downturns before, including the big one in the 1980’s. “There was a whole year I did nothing. This time, for two years, I have done some at least, but now it has picked up tremendously,” she says. Ifera says it’s the recent steadiness of the oil price that is keeping her business afloat. Meanwhile, new business ventures that might have been unimaginable before are gaining speed. Apache Corporation recently upped its expectations for its big new oilfield, from 3,000 new wells to 5,000. And they’re not the only ones feeling ambitious. Off a highway and over a cattle guard, in an empty patch of desert near Fort Stockton, Texas, I meet Jack Hanks, CEO of MMEX Resources Corporation. If built, it would be the first new refinery in the United States in decades. Hanks wants to use it to send oil and gas products to Mexico down an old rail line, though some doubt the company actually has the financing in place to make it happen. And that’s the thing about the energy business. There are always ideas, projections, and a dream of the future, but sometimes the dreams overshoot. The optimism on display in the Permian is being tempered by reports of a growing labor shortage, a lack of pipeline infrastructure to move the growing supplies of oil and gas, and concerns about the industry’s environmental impact.